The Chinese icebreaker Xue Long suffered minor damage on Saturday after striking an iceberg, according to China’s Ministry of Natural Resources. The collision occurred at 69.6 S 94.0 W, off the coast of the Antarctic Peninsula. The Xue Long was making three knots in foggy conditions at the time of the encounter. 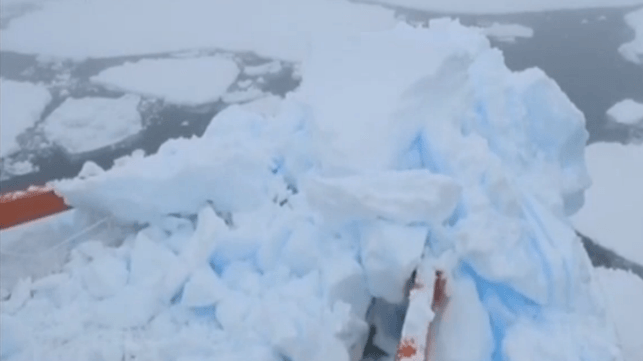 Images broadcast by state television showed a small mountain of ice and snow on the Xue Long’s deck forward, and the crew used picks, axes, firehoses and deck cranes to break the debris free and put it over the side. Video from the scene showed damage to the Xue Long’s foremast, railings and other fixtures on her bow, but no injuries or mechanical casualties were reported.